Why All The Confusion Over Surface Types? In some cases it is just because one stone type looks like another, but very different type. A good example is that many polished granites look like and are referred to as marble. A quick test is a drop of swimming pool (muriatic) acid to the underside of the stone. Limestone and marble will fizz, granite will not. See acid sensitivity link below. Another issue is that each year, manufacturers have become increasingly better at producing products that look like something else. There are many more choices of color, texture, style, density, patterns, etc. Some clay products look like traditional concrete products (i.e. pavers). Some concrete products look like traditional clay products (i.e. concrete mexican tile). Some ceramic tile look like slate (i.e. "stone look" tile). Marketers are increasingly creative about terms and descriptive names. That is fine for their selling purposes, but causes confusion when cleaning, sealing, proper and safe care, are the issues. Sometimes this confusion can actually harm the surfacing material or cause the wrong material to be used for the application requirements. For instance, using acid to clean what was incorrectly thought to be a material not harmed by acids. 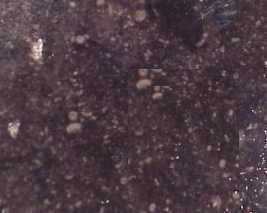 Example: this material was designated and named a type of granite by the distributor. It was installed on a large bartop because granite is not sensitive to acidic drinks or alcohol. After installation it was discovered the stone is really an acid etchable black limestone. Surfaces that can be harmed by acids are marble, limestone, concrete. However, you can protect from acids with the appropriate Aldon sealer. Even fired glazed tiles can be etched if the acid is strong enough. Why be disappointed in the results, when with a little knowledge -good decisions can prevent disappointment. How Aldon helps you properly define the surface type! By providing pictures and information for each material, plus these simple tests. One more consideration. Do not let someone else's prejudice disenchant you with the surfacing that you like. The problems an acquaintance has experienced probably would not have happened if they had the information we are providing to you. Some stores may promote one material type over another for various reasons that do not apply to you. These reasons can include their knowledge base, profit goals, problem history, etc. Just review the Aldon Surface Types page discussing the surfaces you are interested in and you will see the characteristics you need to understand before selecting.